Hey ya'll! I've really enjoyed the other Small Bore Challenges so far and didn't see one for Venus so I decided to start one. Lets see what you guys got! 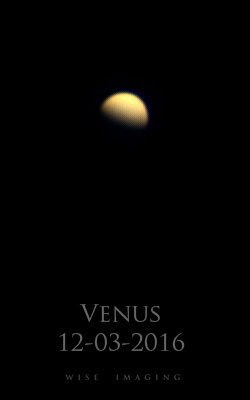 My first attempt ever at Venus. I regularly imaged Venus during the last evening apparition in 2015, and created the montage below. Nexstar 6SE with Neximage 5 camera. I've captured one image this apparition, but unless I find some way of capturing cloud details with my small scope, I don't think I'll bother again, as there's nothing to capture that I didn't get already. I enjoy visual observation of its changing phases, though. That's a great collection of images. I don't get enough free time in early evening, nor enough clear nights to gather data like that consistently. 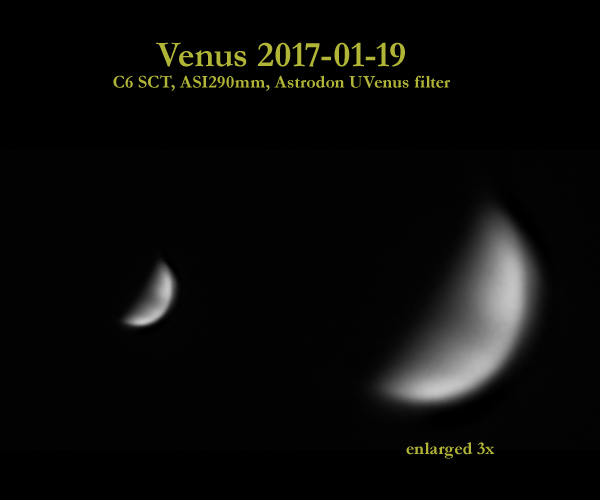 Based on images others have captured, your best bet to capture cloud details on Venus is UV, or IR in the 1000nm range. UV filters are quite spendy, and cameras have more limited sensitivity in those wavelengths. I'm trying with IR when I get a chance to image. Edited by evan9162, 08 January 2017 - 08:19 PM. Thanks, Darin. I understand the time constraints in the evening, but I reckon you'd have more clear nights in Boise than we do in Seattle. I think I got lucky in 2015, though, getting a cycle of clear evenings that allowed me to capture approximately regularly spaced images (first monthly, then every two weeks, and finally weekly). 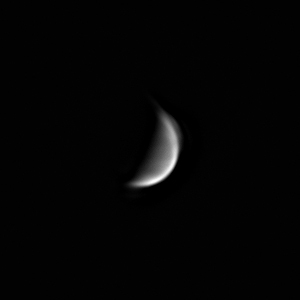 I tried my 610 nm filter on Venus last week, but got nothing out of that. UV filters are out of my price range right now, and I'm not even sure a 6" scope captures enough light to make them useful. I've read that a W47 + IR cut can work, so I might try that on good evening. In the winter, we have a notorious inversion that hangs over the city. It can be a solid 6 weeks without a lick of sunshine or clear skies. The kicker is that 1000' above us can be completely clear, so if you drive up to the nearby ski hill, it's clear skies. Edited by Trevor N, 15 January 2017 - 12:57 PM. Got a lucky break tonight. 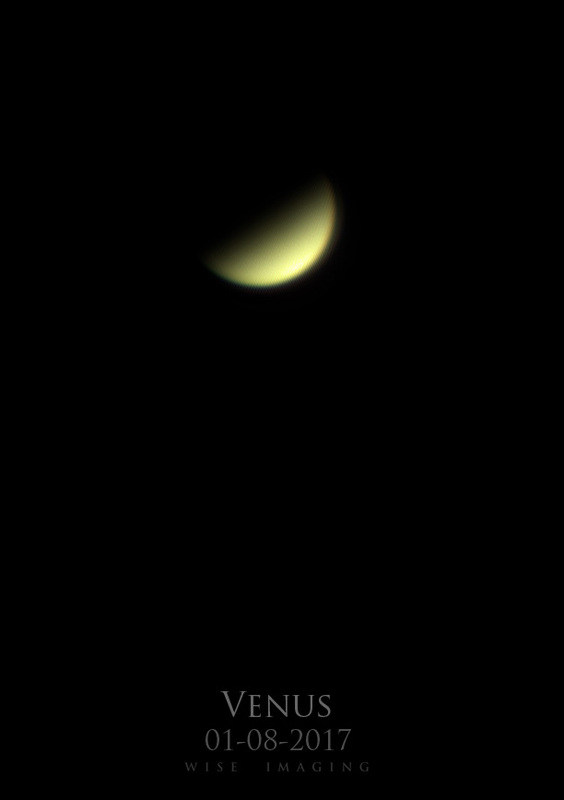 First light with my Astrodon UVenus filter on my C6 SCT. Either focus was not quite right (I checked as best I could with a Bahtinov mask), or the aberrations at UV wavelengths become significant, or the effects of seeing were dramatically worse on UV - but in any case the UV image was somewhat ugly - though it did show cloud layer contrast. 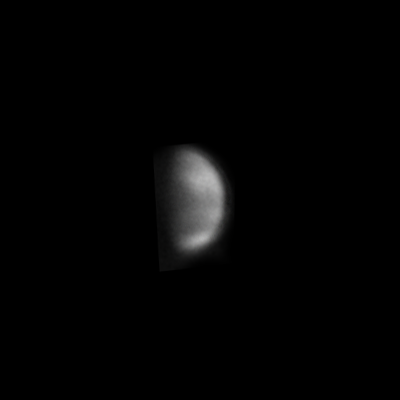 Thus, I used a capture with an 850nm IR-pass filter as the base image, and used the UV image as a darken layer to bring out the cloud contrast. 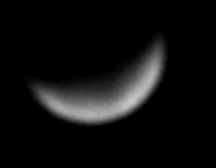 C6 SCT @ 1500mm (no barlow), ASI290mm, ZWO 850nm IR-pass + Astrodon UVenus filter. Got another chance tonight. Not as good. Either the cloud layers aren't as contrasty, or seeing was worse. It was in single digits with a slight breeze, and my hands about froze solid in the 20 minutes I was outside. Did a combo of ASI224mc for color/luminance, and ASI290mm+UVenus for cloud contrast. 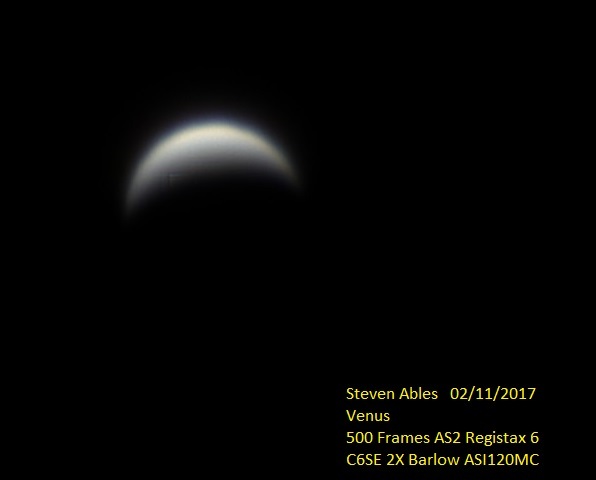 NexStar 6se with 2x Barlow and ASI120-mm on December 18. 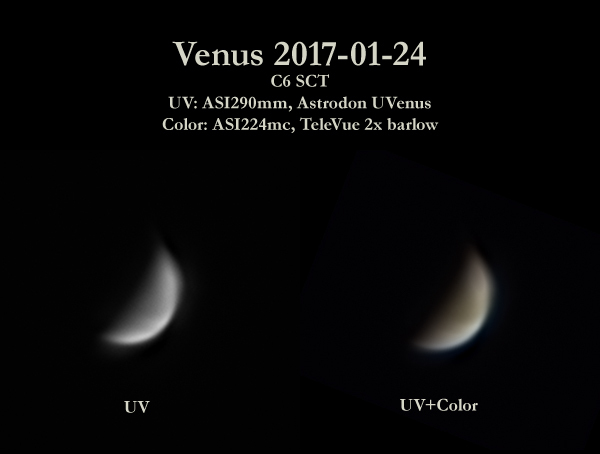 I took a UV image with the Astrodon UVenus and subtracted a blue-filter image; this greatly increased the contrast of the UV details. The color image was taken with a red filter and that same blue-filter image, synthesizing green from the two of them. 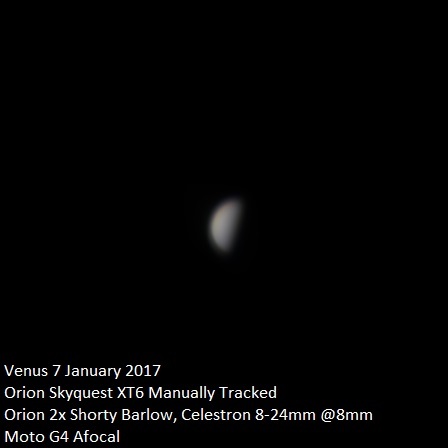 Did you use the barlow with the UVenus filter? If so, how did it impact your exposure time? I've read that the glass used in typical barlows/tele-extenders has relatively poor transmission in the UV bands - a fluorite or fused silica barlow are required to get good throughput with UV wavelengths. 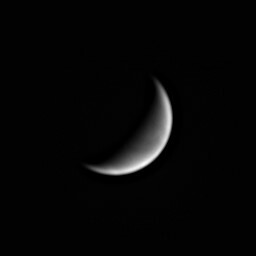 Curious bright patch at the 4 o'clock position in the atmospheric rind. I did use the Barlow and the total exposure time needed in UV is vastly longer than the visible wavelengths. I've experimented with different approaches, but to get this picture, I took 4,000 frames at 200ms for a total of 800s. Gain was set to 93. This worked better than another effort, made at the same time, with 100ms exposures. For blue, I used 10ms exposures and gain set to 29 and took 1,000 frames, so the total light gathering time for UV was 80 times as long as for blue, in addition to the big difference in gain. My first use of the UV filter bore that out, that exposure times for it needed to be roughly 100x what I was using in other wavelengths, including IR. That's a great point about glass vs. alternatives in the Barlow – I'll look into that. In this case, I had a great night and lots of time, but it would certainly be better to avoid throwing the light away. Since I'm in North America, this opportunity with Venus is middling at best, and I've thought of it as practice for the much more favorable declination coming up later this year in the early morning skies. Using an, e.g., fluorite Barlow or no Barlow is worth trying. Those differences in exposure time are about what I was expecting with a regular barlow and UV. The smaller pixels of the ASI290mm get much closer to critical sampling with a F/10 SCT. The ASI178mm has even smaller pixels, but it may not have the sensitivity as the '290. With either cameras, you can do pretty well with a F/10 scope and no barlow. I've considered trying to find/make a small F/10 or F/12 6" newt, but it would mostly be a one-trick pony, and I haven't found anyone that makes 6" mirrors longer than F/8. I'd have to custom order one, and by the time it was all said and done, I'd probably be better off getting an off-the-shelf 6" F5, and ponying up the cash for a fused silica barlow. I've discovered that the spherical aberration (due to spherochromatism) at UV wavelengths of my C6 is pretty bad. Like, really bad. I'm considering getting a long-focus newt for UV imaging. It might even do better than my C6 for planetary stuff (better contrast due to a smaller CO). 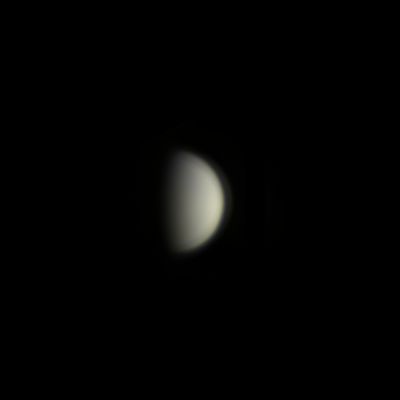 Since you asked this, I tried imaging Venus in UV without my Barlow, and it certainly led to a much quicker exposure time. With: ASI120mm, 200 ms, Gain 93. Without: ASI1600mm, 23 ms, Gain 340. This is an imperfect experiment, since the two cameras and what gain means for them is different, but that aside, the exposure itself was sped up by a factor of 8.7. The reduction in magnification alone explains 4x of that, because the light was being concentrated onto 1/4 as many pixels. So, ignoring the camera/gain factor, we get a ~2.2x speedup, which may imply that the Barlow has a transmission of only ~40%. That said, it's an open question as to which one is truly preferable. 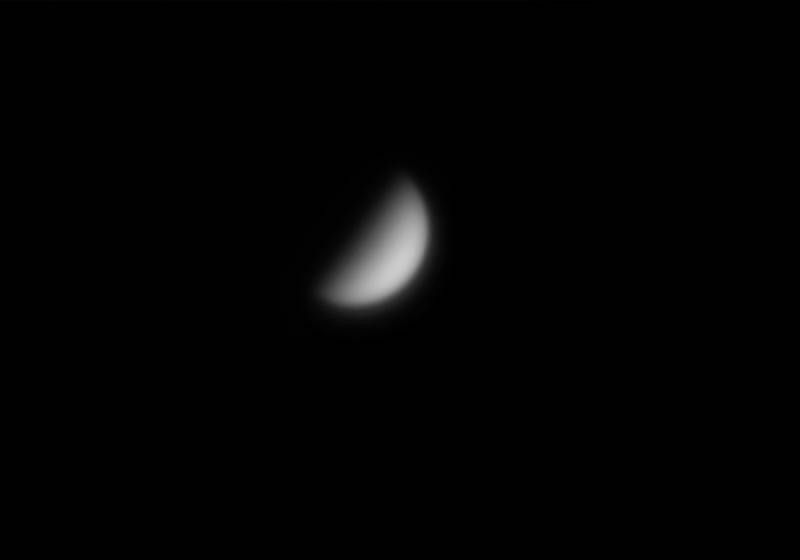 Spending ~35 minutes capturing Venus isn't unreasonable. I suppose there's some blurring, potentially, as the cloud tops rotate, which amounts to about 3.6° per hour. 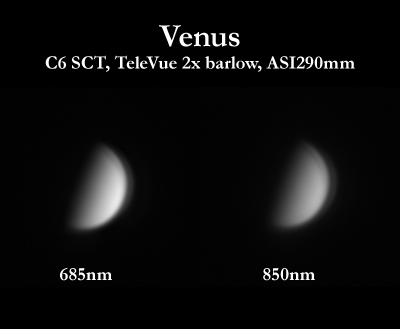 When the main opportunity for imaging Venus arises around June-August of this year, I'll experiment with both. I've attached the image that resulted, and it looks similar to your image from about the same time. The time of mine was UTC 2017-01-29 03:20. Since we have similar gear, it's quite interesting to compare results. You used 25% of 30K frames; I kept 1166 out of 4K frames, and in the stacking phase, discarded any pixel with values outside of 1-sigma (i.e., about 32%). In various experiments of mine, I've seen a diminished value in frame numbers above 1200 or so, but that may depend on seeing, etc. Mercury and Venus – and occasionally Mars – are the targets where I collect the most frames, because the circumstances often prevent me from allowing proper cool-down time. 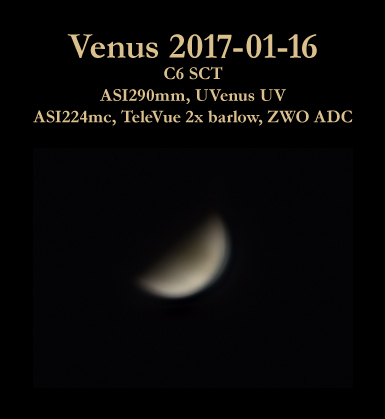 First good Venus with my new Orion Optics (UK) VX6L newt. My first attempt ever at capturing Venus. This is also my first ever capture using the ASI120MC and my new Celestron 6SE. Hopefully, my efforts will improve with experience! This was taken two nights ago. Seeing was pretty rough but it was a nice night to be out. Used my 2x Barlow along with the ASI120MC. You and I have very similar gear – the only things I would try are: Make sure your telescope is well-cooled to match the night air (perhaps you did; it can create the sense of poor seeing even if the atmosphere outside your telescope is actually OK) and, particularly with bad seeing, shoot more frames and discard bad ones to make up for the seeing. I fee like 1200 "keeper" frames – very roughly speaking – is a solid number for getting the clearest images. That said, your result is great! 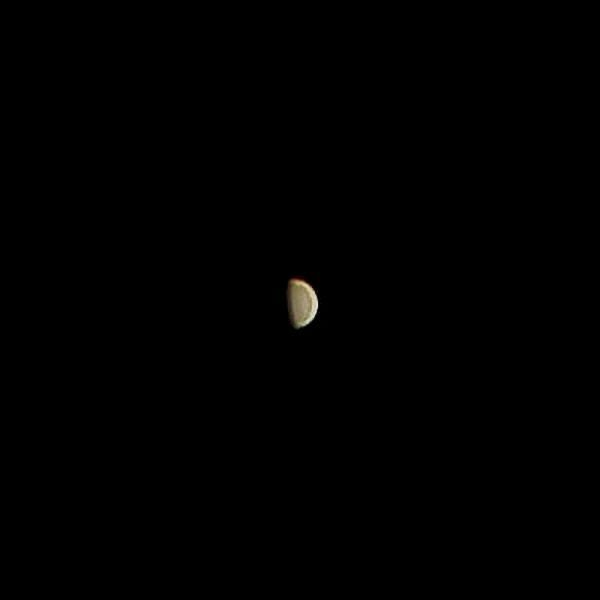 It's nice to see the very subtle color of Venus and you did a great job of capturing it. Made a go with my Stellarvue SV80ST2 and a 4X Powermate with a QHY178C camera. Way oversampled but given that I had plenty of "light" and since I was working in RGB I don't think it mattered much. Anyway, I was also using a ZWO ADC and the colors came out pretty neutral. 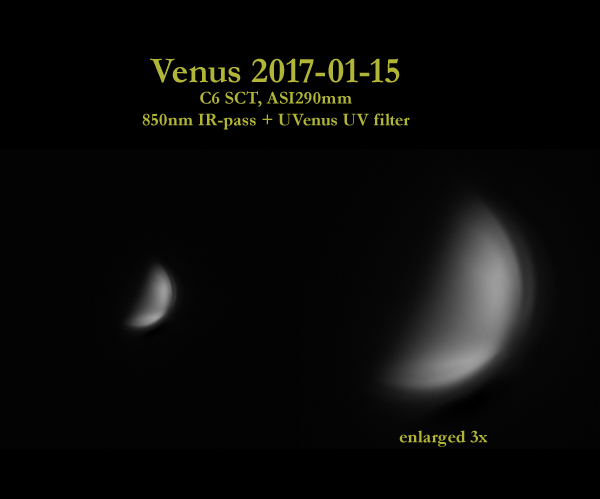 SkySafari says Venus is 43.5" in diameter, so the scale works out to 0.25 arc seconds per pixel with an effective focal length of around 2000mm (f/25). Exposure time was 7.7ms with a gain of zero and I stacked the best 10% of 1000 frames using the AutoStakkert! 64-bit beta release. Capture date was February 23, 2017 at 7:13PM PST. Edited by james7ca, 24 February 2017 - 04:28 AM. 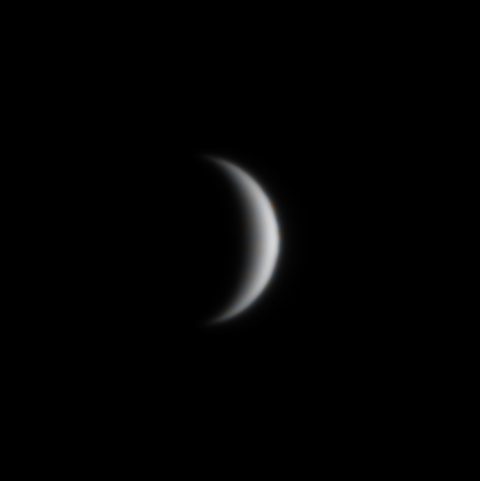 I've had limited opportunities for night imaging, but today I captured Venus at about 2pm local time in a very hazy sky. Using an IR filter, the sky appeared almost black through my camera even though it was more white than blue to the naked eye. 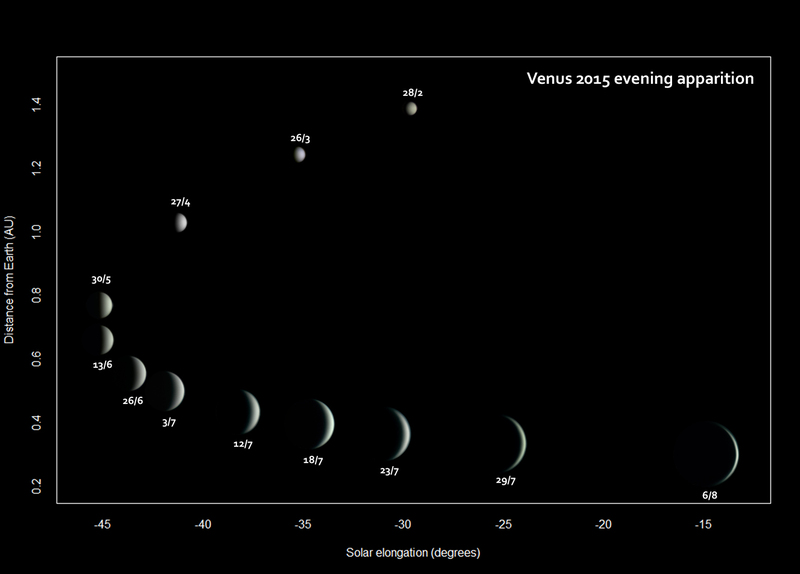 Here is an animation of the phases of Venus changing over the past few months. My images were taken between September 16 and February 24. Some of these were taken with a red filter; some with IR. Edited by rehling, 24 February 2017 - 06:14 PM.